The Atlas Race snowshoe provides the ultimate competitive edge for winter runners. The Atlas Race snowshoe is the perfect tool for winter running enthusiasts. Driven by Spring-Loaded™ Suspension (SLS), the Race stays close underfoot and allows a natural stride over uneven terrain. Featuring the featherweight LightSpeed Pro™ binding, the Race further lightens the load with titanium crampons, providing fitness enthusiasts and our own athletes on the Atlas Race Team the ultimate competitive edge. The lightest binding Atlas has ever constructed, the LightSpeed Pro Binding is designed to hold the foot securely for exact placement on technical trails. 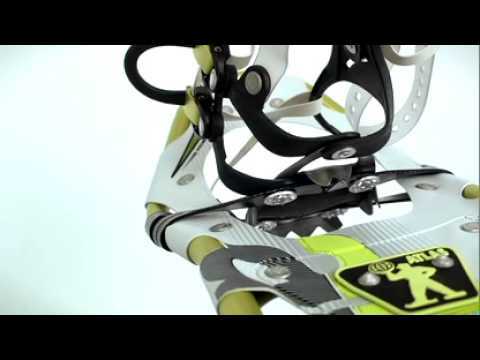 Ounces matter, so we designed the traction of our Race snowshoe with titanium toe and heel crampons for the sure footing with no weight penalty.